A Chinese company claims to have produce the thinnest tablet on the market at less than 6mm - that's thinner than the Sony Xperia Z3 tablet compact. The Cube iwork 7 is 5.95mm thick - same as the Dell Venue 8 7000 - and will cost a mere 399 Yuan (about $65, AU$74, £41), which means that it will be one of the cheapest WIndows 8.1 tablets when it hits the market later this year. 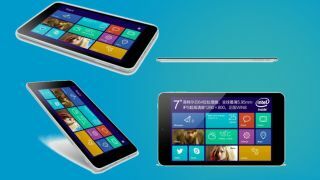 The device is designed to be handled with one hand; not much is known about the specification other than the fact that it runs Windows 8, is powered by Intel's ubiquitous BayTrail Atom processor, has a front facing camera and comes with a 7-inch 1,280 x 800 pixel IPS display. Cube's Weibo page also mentions 3G connectivity and HDMI while photos of the device leave us to believe that there will be a microUSB port and a microSD card slot. Expect it to run on only 1GB of RAM with 16GB of onboard storage. This model doesn't come with a free subscription to Microsoft Office 365 and you will have to fork out an additional 200 Yuan to get that extra piece of software.